Wow. 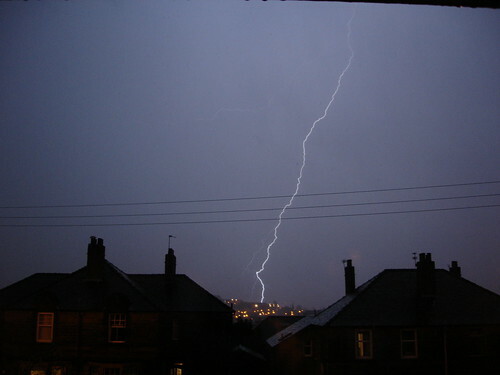 That’s the most intense lightning storm I’ve seen in Glasgow. In fact that’s the most intense lightning storm I’ve ever seen. 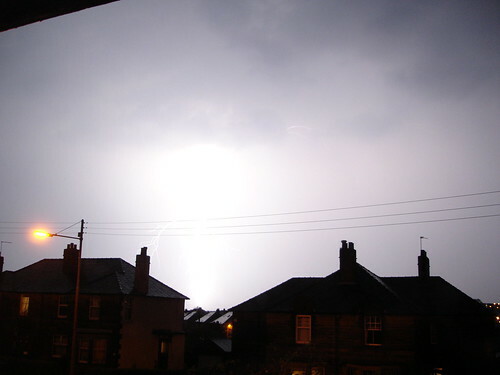 Lasted about an hour, torrential rain and a massive amount of lightning and thunder. I’ve uploaded some pics to Flickr. Enjoy – I did.
) Good excuse to get a cheap PVR from Argos which works well. My ADSL modem also went on the blink coincidentally and on visiting my local PC shop the guy said that on Friday they had about 40 people in with blown modems/network cards/mobos and cordless telephones. Not sure the insurance covers this either. Anyway, it’s taken a couple of days but I’m back up and running with the old router. Ouch – not good news. There really is a lot to be said in unplugging everything from wall sockets and aerials when there’s lightning involved.